Apex has released a new product in leak detection using flow technology. The Apex Flow Leak Detector opens the door to leak detection with a variety of gases, including air. Find leaks as small as 0.0025 standard cubic centimeters per minute (sccm). If your process flows a specific gas or even air, why test with helium or hydrogen when you can test for leaks with the gas that is important to your process. Using air, the Apex Leak Detector creates an accurate and dry leak detection system possible for use in industrial and research applications. Choose a specific gas from the 30 gases in the Apex gas library to pressurize your desired test piping or equipment. 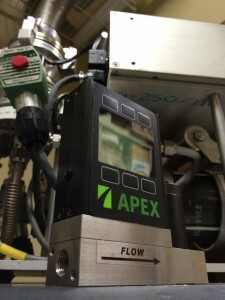 Set the pressure on the Apex Leak Detector to the desired testing pressure and being flowing gas. Once pressure has been reached, monitor the flow. If the piece being tested is leak free, then the flow will equalize at zero once pressure is reached. If there is a leak, to keep that pressure steady the Apex Flow Leak Detector will have a flow value. This flow value is directly proportional to the leak size depending on the pressure being tested at.